Gunasegaram says she came up with the idea shortly after her son was born more than four years ago. She found herself keeping track of his feeding schedule on assorted scraps of paper. She and her husband scoured the ‘Net for an online service that could help them. They couldn’t find one, and a business was born. Interestingly, they also ran a piece called Will the soccer moms buy it? in reference to soccer moms buying the iPhone by Apple (sooo much hype about the iPhone and sooo little time to read all about it). According to their source, 60% of soccer moms would not buy one. I’m not a soccer mom (yet) and even if I wanted to buy it, who has $600 + peripheral fees + monthly service fees laying around?!? I’d rather spend the money on my kids, a day at the spa, or building Babble Soft! Or better yet we could spend it on making our application iPhone compatible! 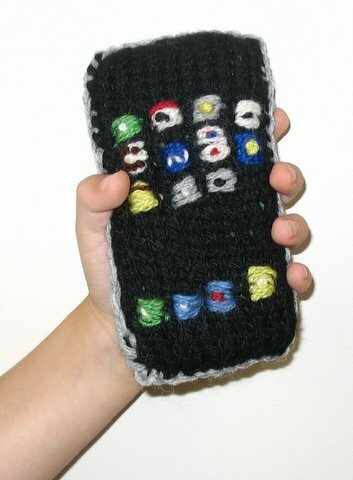 But here’s something soccer moms probably would want to buy for their kids: a hand knitted iPhone! Daddy Types‘ mother created it. What a cool mom! You might wonder why I’m writing about this particular article and the answer is because a friend of mine, Thom Singer, is quoted in it! I’ve known Thom Singer and his wife for a few years now, and he is one of the few guys I know who actually used to be a stay-at-home dad when his kids were little. I have several friends who have stay-at-home husbands but I don’t see their husbands very often. Thom and I run in the same business circles here in Austin, and he’s proud of the fact that he was a stay-at-home dad which is refreshing in an often old-school, male dominated business environment here in Texas. I recently saw him at a local Texchange event where out of 120 attendees less than about 20 were women. Since Thom has been a blogger for quite some time (check out his blog at Some Assembly Required) he has been a great person to talk with about establishing my blog! Happy Father’s Day to all you great Dads out there! p.s. 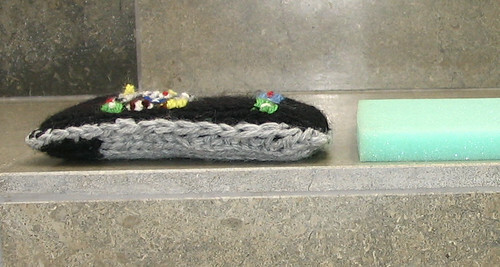 Don’t forget that our 20% off Father’s Day code, FATHER#1, is good through the end of the month (June 2007). I have certainly seen the increased involvement from fathers in child rearing within my peer group, but I wouldn’t say those days are “long gone” because I know several moms who do pretty much all the (non-paid) work at home whose husbands do all the (paid) work outside the home. I believe we are in the midst of an interesting shift in American/Western society. The week before Father’s Day (Sunday, June 17) is finally upon us and I thought it might be interesting to write a short post about the origination of the day as well as provide you with some other neat links. In the US, the first modern Father’s Day was celebrated on July 5, 1908 in Fairmont, WV. It is also suggested that Sonora Smart Dodd drove the effort to establish the Day to honor her father, a single parent of six children. The first June Father’s Day was celebrated on June 19, 1919 in Spokane, WA. There are many things you can do for your father and/or father of your children and if you aren’t able to do anything really mind boggling this year, then there is always the ‘ole t-shirt option. If you have a lot of time on your hands and would like to read a long article on expecting fathers check out: Medical Technology and Childbirth: Experiences of Expectant Mothers and Fathers. If time is hard to come by these days, you can read some lighthearted Father’s Day quotes or even get a chuckle out of what people in Stockholm, Sweden think of the US Celebration of Father’s Day. With all that said, remember that Dads tend to like gadgets over ties so use the 20% off special going on this month to buy him or any expecting dads a gift subscription to Baby Manager. Remember that you can take advantage of the special to buy gifts for numerous baby showers you are about to attend (subscriptions aren’t activated until the user first logs on)! * Why do you believe he is deserving of the “Best Dad Ever” title? * Share a story that clearly illustrates just how special he is. Once finished, email your application, along with any pictures/additions that show just how wonderful they are, to info@mommytalk.com. Submissions will be judged by our selected panel of moms. Submissions must be emailed in by June 15th and the winner will be announced on Father’s Day, June 17th. Fathers of the Future: How Many Dads Will There Be? As I was driving back from dropping my son off at his pre-school today, I heard a radio announcement by washington post.com mentioning a recent article on The Birthrate of Boys Is Declining by Rick Weiss that starts off with “If you are thinking of having children and want to have a boy, you might want to book that romantic weekend getaway soon. Boys are getting harder to make, according to a new analysis.” [You can register for free on their site to see the full article] They have observed this phenomenon is the US and Japan. Some of the reasons cited had to do with fewer males being conceived as well as the current hypothesis of greater exposure to gender-bending pollutants. What does this mean for the fathers of the future? Interestingly (prior to hearing the article mentioned on the radio), the ‘bug guy’ as we call him came to the house this morning. The kids were with me but we left soon after he was done with the inside and he continued to spray the outside. Coincidentally, I asked him what he knew about pesticides, pregnant women, and babies. Previously I had heard that exposure to certain pesticides while in utero can result in learning disabilities (e.g. autism) later in the baby’s life. He said he has been following it closely. He said he sprays very lightly if there is a pregnant woman in the house and since he typically uses very safe chemicals he doesn’t think there is a big risk. I remember asking him not to spray inside the house when I was pregnant and when the kids were babies. I figured 6 to 12 months of having a few extra bugs in the house was worth managing the potential long term risk; he still sprayed on the outside because here in Texas we have all kinds of ants and other crawly things especially when it rains a lot. We have a boy and a girl, and I believe the bug guy has 4 girls from two different marriages. It gave me pause. If any of you parents and/or scientists (real or pretend) out there have anything to share about this phenomenon, please leave a comment and let us know your opinions, thoughts, and ideas. Author: Aruni | Filed under: dad, father, Father's Day, parenting | Comments Off on Fathers of the Future: How Many Dads Will There Be? For the first time in 20 years Bill Gates (founder of Microsoft and the Bill and Melinda Gates Foundation) and Steve Jobs (founder of Apple, NEXT, and Pixar) sat down for a joint interview on May 30, 2007 for the Wall Street Journal’s All Things Digital D5 Conference. The interview is hilarious and awe inspiring! Bill and Steve have achieved such outstanding professional success and their companies have affected many of our daily lives more profoundly than any other high technology companies to date. Microsoft and Apple laid the groundwork and helped train individuals who have since created companies of their own that have enabled email, blogging, Internet browsing, mobile devices, and Internet search (don’t tell Google) for the masses. Being an entrepreneur, I can appreciate how much effort, energy, and passion it takes to build even the smallest of businesses and for each of them to make it from Founder/CEO and still be heavily involved with their company’s decades later (even though Jobs had a little break during his career at Apple) is down right jaw dropping! Bill married Melinda French in 1994 and they have 3 children born in 1996, 1999, and 2002. Steve’s first child was born in 1978. He later married Laurene Powell in 1991 and they have 3 children who were presumably born after 1991. Babble Soft released its first PC/Pocket PC version of Baby Manager in 2005 (just after our second child was born) and we released Baby Manager Web and Mobile in March 2007 so it’s unlikely we will have the chance to say that two of the most famous dads in the technology world used our software when their kids were born. Oh well, maybe some other up and coming dads in the tech world will discover us before their babies are born! Baby Manager was created using Microsoft technologies. The application works with the most commonly used browsers (e.g., Internet Explorer, Safari, and Firefox) and the latest Microsoft OS based PDAs and Smartphones. One of the reasons we created a web application was because expecting parents were emailing us asking when we would have a version that ran on the Mac. In 2005, I was barely holding my head above water with 2 little ones, so we put PR on hold until recently so we could more effectively use our limited resources to reach all the interested, Internet savvy new parents in the world. We do use our Mac to create graphics and design product literature. However, the PCs in our office outnumber the Macs…but if Macs start running Windows then the ratio might change. The most interesting observation I can make about these two famous dads is that they have very different personalities, followed their own paths, have different strengths & weaknesses, and achieved financial success by being true to their own visions. As someone who also interviews people on the topic of success, this observation further affirms my belief that ‘people should follow their own path to success, not try to mimic someone else’s.’ Every second that passes the world is different, and what has worked for others in the past may not work in the present. There’s a reason we all have different fingerprints! In honor of Father’s Day, Babble Soft is offering 20% off on subscriptions of Baby Manager during the month of June 2007 using coupon code FATHER#1. In this day and age men are much more involved in parenting and although they can’t have babies or breastfeed (yet), overall they are generally more helpful around the house and with a new baby than their dads were (i.e., change diapers, get up at night, feed the baby, do dishes, etc.). So if you know a new or expecting dad, get them a subscription to Baby Manager for Father’s Day and give them an excuse to play around with cool, new technology while helping out their spouse (which may be you)! You can even take it for a test drive by signing up for a FREE Trial. Dads, you now have a reason to replace your existing phone with a cool, new Smartphone; to assist the mother of your child in ways neither you nor she ever expected you could. Imagine your wife asking you when and how much you last fed the baby and you being able to drag your mobile device off the nightstand and say in a sleep-deprived tone of voice “Honey, she had 3.5 oz of breastmilk/formula at 2:42 AM and I changed her diaper at 2:30 AM.” She then replies “oh, thank goodness it’s 3:00 AM and I can go back to sleep for a little while longer…you’re the greatest!” This scene can be a reality for all the tech savvy, new dads out there if you choose wisely and give them a subscription to Baby Manager for Father’s Day! For a wonderful testimonial from a dad user see below. “My wife and I are missionaries in Bolivia. Our first child was born here while our extended family was in the U.S. On our own for child care, we found that waking up every few hours to feed and change the baby was challenging. Since we wanted to put our baby on a schedule, we decided it was best to take shifts at night. My wife took care of him from 11 p.m. until 3 a.m., and I took care of him from 3 a.m. until about 10 a.m. We shared responsibilities during the daytime. We learned quickly that it was not helpful for me to get up with the baby at 3 a.m. only to have to wake up my wife and ask her when he was last fed. When we downloaded Baby Manager for Pocket PC, it transformed childcare in our house. First, we no longer needed to bother the other person with questions about diaper changes, bottle feedings, and breast feedings. It was all there. Second, since my wife breastfed our baby and pumped, Baby Manager provided an easy way to ensure she was “keeping up” with the baby by pumping as much milk as he needed. Finally, not only did we have the answers to our pediatrician’s questions, she was actually impressed with the level of detail and information we had from the reports on bottle feedings, breast feedings, diaper changes, etc. Baby Manager helped us get through the first difficult months of child care. We needed to develop the good habit of recording important information about our baby, and Baby Manager helped us do that. In turn, it helped me and my wife to communicate better about baby care. It is the best solution for a single parent, or for a family with multiple caretakers, who need to collaborate and share this vital information.